Mostly of Ito marine town (ch07/this chapter), didn't have too much time to explore unfortunately. I started to miss my old friends. And I thought that because Mr. Mez was away, we won't get any Aria/Amanchu this month. But surprisingly I got 12 today. Thank you very much. I will copy first comment and go prepare hot cocoa and Kawai Eri's songs. i thought mr.mez away till dec.
glad to see you and amanchu !! so you still do translation Mr.Mez? This chapter hurt. Brings me back painful memories of leaving Japan during Primary 2. 2009. dec. 25 morning: Ms. Amano finds a Ferrari in her garage. The attached letter says: "It was a happy Xmas season for us. Thank you for the effort! We wish to make it a happy Xmas for you, too! The Digital Photo Frame Manufacturer Industry Association." On a more constructive note, this chapter at least explains Ooki's mobile phone addiction we saw in the first chapter. Sorrowfully it looks like she doesn't have a boy waiting for her. Guess, american audience would find it easier to identify with this chapter, as europeans seldom move. The download just ended so I'm going to listen to it whole right now. I'm thinking of translating KiRite's story, because it's a very pretty one. Though I still haven't managed to crack those OCR software someone recommended me. It was out in August. I didn't get a chance to buy the album till lately though. There's still the memorial DVD included in the album that I didn't upload, but BUY THE THING if you want to watch it. It appears RAI Gulp TV will air episode 5.5 as part of the regular Aria The Origination run tomorrow? That's a bit strange, since ep 5.5 appeared unfinished / partial animation to me, something thrown together from leftover material, exclusively for the DVD. Ep5.5 looked finished, especially with the high amount of accuracy with the real Venice. First half was original while the connecting second half is manga material. I doubt Amano is sponsored by the photo frame industry. There are lots of different brands and she doesn't endorse a specific one. One wonders though whether Futaba doesn't have a computer to upload her pics to. The depiction of Futaba's distress is quite a departure from Amano's usual work. Her stories might at times be contemplative, but Futaba really seems to be rather depressed for most of the chapter. Maybe Amano is becoming more melancholic with age. I can only applaud it, since it gives her characters more depth. I don't think Dotty got any more depressed than any of the three undines some point in time. Aika finding out about other employees badmouthing Akira comes to mind. If we try to analyze the situation from her technology-challenged perspective her level of distress is quite understandable. She didn't even consider the possibility of running out of space to store her pictures, and she valued each of those because of the precious memories she'd remember every time each picture showed up as her wallpaper, so the revelation must have been quite a shock. I think that even if she knew she could store them in a PC she'd still waver since she wants to have the pictures somewhere she can look at them randomly once in a while. It's like having too many songs you want to put in your mp3 player. She's clever enough not to waste time on computers. Once you sit down in front of the self-illuminated fishtank it becomes increasngly difficult to get up and leave for open air. Every minute one spends in front of a computer is wasted time .. including the time spent on downloading or discussing Amano manga. Now that's a paradox! "Every minute one spends in front of a computer is wasted time"
Hey now, I use a laptop to write novels, so it isn't all bad. But yeah, the Internet can indeed be a time-waster. 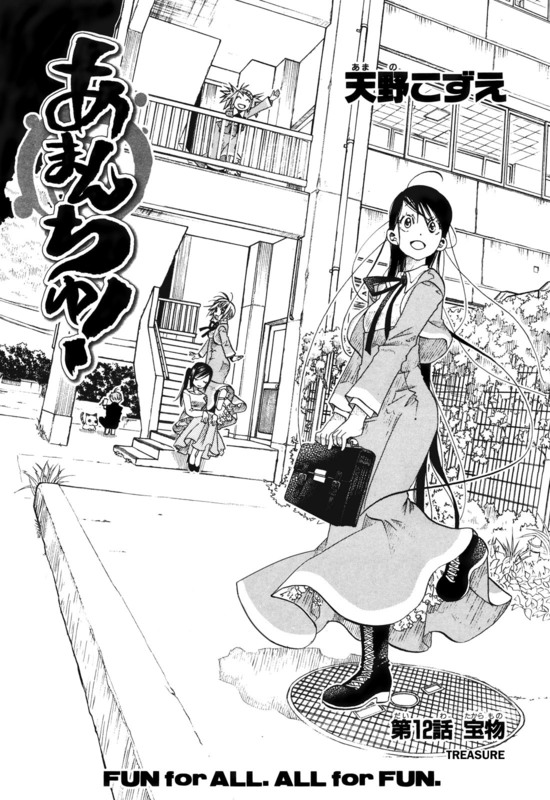 where do u get Japanese Amanchu scan? We also have our own RAW scanner (Zhukov). Does Yumegaoka High exist or is it a fiction? 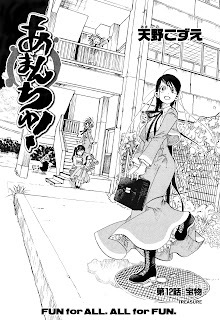 I foung "Yumegaoka junior High" but not sure is it the same school..
because i thought Amanchu should be about Yumegaoka seniort High..